Independent Video Games and Apps developer, Derp Studios, today release its tactical objectives app created with Games Workshop to accompany the Warhammer 40,000 board game. The team which includes Train2Game students has been working with Games Workshop to create the app. The app has been designed to assist in playing the latest version of the popular table top game, offering a digital version of tactical objectives cards which previously were only available on limited edition print runs. 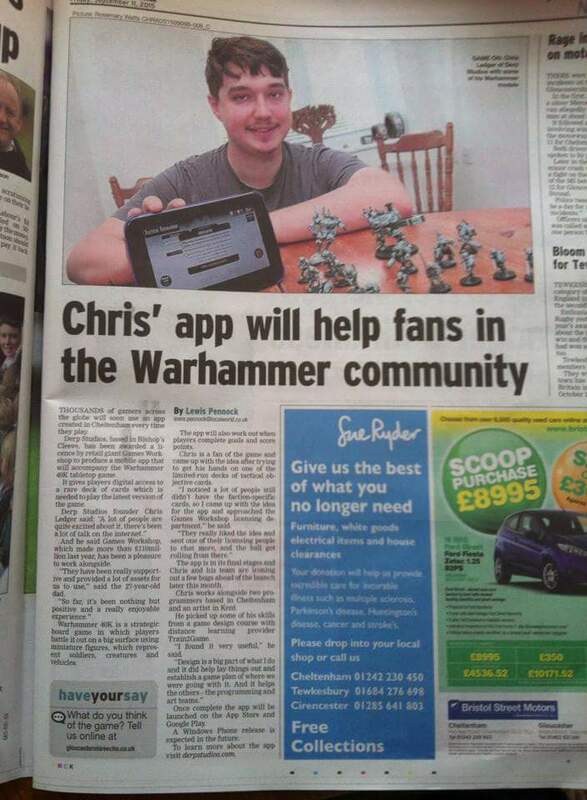 This is one of the first ever official licensed hobby apps which supports the Warhammer 40,000 table-top game. The Train2Game blog recently posted an article about Derp Studios releasing a fully licensed accompany App for the incredibly popular Warhammer 40,000 table top game. Since we highlighted this incredible feat, the story has been placed in the popular regional newspaper The Gloucestershire Echo. 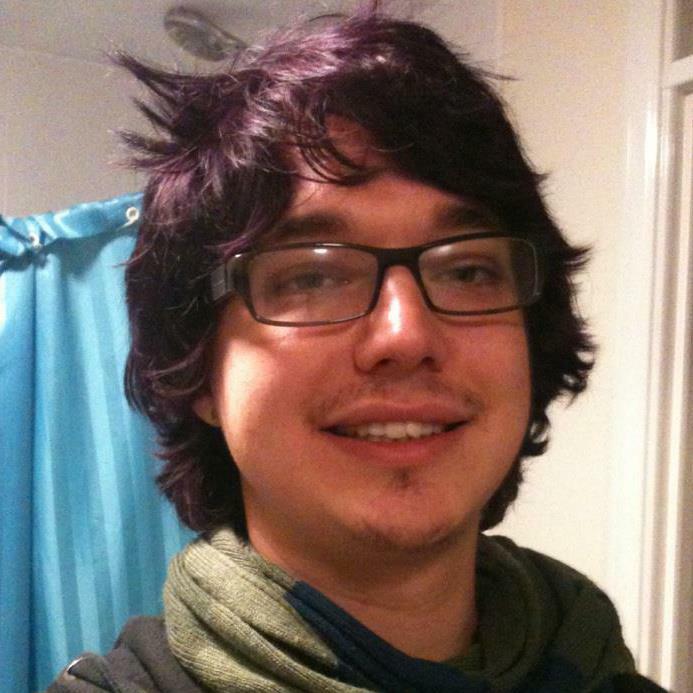 Chris Ledger who heads up Derp has been working with the Train2Game Communications team on the launch of the App. The Train2Game team bought the story to the attention of The Gloucestershire Echo as part of Train2Game’s ongoing commitment to supporting students and their development as professionals in the video games and related industries. If you would like to hear more about Derp creating the ultimate fully licensed Games Workshop App, make sure to keep an eye on the Train2Game blog. Read the full interview on the Gloucestershire Echo here. Train2Game student studio Derp Studios has teamed up with Games Workshop to create a companion app for the popular tabletop game, Warhammer 40k. Derp Studios Ltd is proud to announce the signing of an agreement with THE revolutionary fantasy and sci-fi tabletop wargaming pioneers, Games Workshop, to develop and launch the Warhammer 40,000 – Tactical Objectives App for Apple, Android and Windows Phone 8 mobile devices. The Warhammer 40,000 – Tactical Objectives App app is a must have for all fans of ‘Warhammer 40,000’ (7th Edition) and is based upon the tactical objective cards used in the ‘Maelstrom of War Missions’. The app will feature all 36 tactical objective cards, as well as providing support for each of the 6 Maelstrom of War Missions. In addition, users will be offered in-app purchases allowing players to add the faction deck of their choice. As an added bonus, the new ‘Cities of Death’ tactical objectives and missions that were revealed in issues 47 and 48 of the Warhammer magazine, White Dwarf, will also be included in the App Store price! The Warhammer 40,000 – Tactical Objectives App will be available for purchase via Apple, Android and Windows 8 mobile app stores in Q3 2015, with an initial SRP of GBP £4.99/EUR €5.99/USD $6.99/CAD $6.99. Additional In-app purchases for faction specific tactical objectives will have an SRP of GBP £2.49/EUR €3.59/ USD $3.99/CAD $3.99 each. “We are truly thrilled to be an officially licensed Games Workshop developer. We’re a small team with a real passion for Warhammer 40,000. We designed the app so all players can have the chance to own a tactical objectives deck for their faction, without the worry and frustration of them selling out, due to high demand” commented Chris Ledger, CEO and Lead Designer, Derp Studios Ltd.
Two Train2Game student studios have worked together for a mutually beneficial project. The student studios studying with Train2Game have joined forces to release game Two Souls on free to play 3D gaming website: Gamonaut. A Lite version of the game developed by Derp Studios is exclusively available on Icey Monty’s popular gaming website. The partnership has come together as both studios won a Swan PR Train2Game competition to gain free PR for a month. Gamonaut developed by Icey Monty has around 1/2million plays on its site to date and its numbers are rapidly growing. Two Souls is one of Derp Studio’s many popular gaming releases, the full version of the game is now available to buy on Android and Windows 8 mobile, with planned release on iOS in the near future. These two joining forces is an excellent example of Train2Game students supporting one another to further their careers. Icey Monty and Derp Studios scoop a month’s free PR in Swan PR Competition. Train2Game student studios beat stiff competition to win free PR services from the leading technology and gaming PR firm. Judges couldn’t separate the two potential winners of The Swan PR competition, deciding the best thing to do was to have two winners. Both studios will now have PR packages designed for them and Swan PR’s support for a month of PR activity. Icey Monty wowed the judges with its online games website Gamonaut, which releases a new title every week. Whereas Derp Studios impressed the judges with its 2 Souls game, which has players controlling two characters in a platform puzzler. The Swan PR team will be taking the studio’s games to UK press for reviews and features, as well as advising on social media. The studio’s creations will feature in blogs and on websites, getting the much needed publicity that will result in titles getting in the hands of gamers. Introductions will also be made to business connections to give the teams further support in releasing their titles. Watch this space as Swan PR will continue to announce more details of the winning studio’s games. Train2Game Student Studio, Derp Studios, has released a game on Windows 8! Derpman and the Code Monkey conundrum. The game is an endless runner, similar to Temple Run and Subway Surfers, where you must run, jump, slide and attack the Code Monkeys that are attacking you to get as much score as you can get. It has a good nostalgia trip for those slightly older gamers among us who remember playing the ZX Spectrum as the graphics and soundtrack are made in that style. The game was created in a single week for an online event known as a Speccy Jam. The rules of the jam were simple, create a game in the style of a ZX spectrum, simple yet different! The studio has recently been creating a series of comics, in what little spare time they have, known as Derpman which is a parody series of your favourite superheroes. Following on from the comic series it seemed a logical step to create a game on the bumbling green clad hero. Congratulations on the games release guys. Wow, I must say its been a busy year! A lot of events both good and bad have gone down. However many lessons have been learned and you know what? I’m going to list off a few of these lessons, as I’ve had to find out the hard way! It may sound simple but it really isn’t. Even the most simplest of ideas can spiral into something a lot bigger. As a start-up you want to aim small, create some stepping stones that can lead you onto bigger things. Even create some tech demo’s!! If you create massive projects, you risk never finishing or having to cut them short (depending on your team structure, finances and time in general). Whilst big projects are achievable, it usually means you’re developing one big title instead of several small ones. This isn’t to say that you should reskin everything, it’s being creative inside boundaries and restrictions. I swear it’s companies that reskin everything which crash the video games industry!! I find that doing game jams are a great way to make a quick qwerky title that you can blast out in no time. Slap on some ad support and post it on any store you can! Always keep track of what goes in and out of your company financially. Know your profit, know your overheads because you can make a decent amount by selling a game and because you haven’t been logging your companies income and expenditure properly, you realise you’ve made a loss. So my advice is that you log everything when it happens and don’t rely on bank statements and PayPal to record everything! Always work out a cash flow forecast as well. It’s very important to show publishers, the government and other important people who could help you out. 3: Dont work for free!!! Okay if it’s a self funded project then there are exceptions, however if a company wants to utilise your skill sets, make sure you whack a price tag on them. When doing this, make sure you aren’t pricing yourself out of the market. You want to be affordable and reliable. Always draw up contracts of terms and conditions and ALWAYS GET A BRIEF. Always stick to the brief and deliver, if clients want anything else they will have to draw up a new brief and pay extra. Don’t let people push you around. If you work for free, people will take advantage of you and make you work to ridiculous extremes. Not everyone is like that though, there are some genuinely fair people out there but they are far and few between when it comes to working for free. So put a price tag on those skills and make sure you have a decent portfolio to back up your price tag! 4: You’re already in the games industry. That’s right, as soon as you start making a game, you’re pretty much in the industry. So man people work on their own projects and say they want to be in the games industry, however what they don’t realise is that they already are. Just because you’re not in a AAA studio and are coding in your bedroom does not make you any less professional and legitimate than someone with a £30,000+ a year salary at Square-Enix. This should of been number one as its my pet hate in this line of work. No matter what role you have in a team DOCUMENT EVERYTHING. That’s right, I can’t stress that enough. If you’re ill and can’t work and someone has to pick up the slack, they will need guidance. They will need to look at what you’ve done and what needs to be done. As your projects grow you will need to log everything because your idea may not be communicated properly and your Elephant Gun weapon, for example, may end up being an Elephant with a gun as the player character. Designers, make sure you have concepts, high concepts, pitches, game design docs, story bibles and level design docs as your raw minimum. Coders, make sure you comment your code appropriately and professionally, comments really help others out especially if a designer needs to adjust a variable or two for some balancing. Get a Technical design document sorted out so you have a clear blueprint of how your code works so that whoever picks up the slack during illness or your departure to can carry on. It also means that people with the clearance to alter bits of code can do so with ease. Artists, remember that your first attempt probably won’t be your best and don’t expect to get it right first time. Always iterate and try different things. Create a concept diary and aid the designers and coders the best you can. Create character sheets, bestiary’s and make sure you log down the poly and vert count of a model and document what maps and textures models require in their own specific documents. It sounds like a lot of work and it is. Not everything in the games industry is fun and glamorous. You’ll have your good and bad days like any other job. Trust me, I love my job, but there are some days I would rather just stay in bed instead of modifying the game design doc or using UDK. People will let you down no matter what, it’s in our nature. Staff will come and go so always be prepared to call in a replacement. It’s not the end of the world, even though it is fairly gutting and stressful. I had 3 staff leave in the space of a week but in the end I found some replacements. As harsh as it sounds, everyone can be replaced. People will also tear apart your ideas, especially clients. You will also find yourself tearing other people’s ideas apart in order to get something working and to make the project feasible, even as the boss my ideas are torn to shreds as well! It’s tough out there but don’t give in. No one is doing it to personally spite you and if they are then they aren’t worth working for. So keep it pro and be a bro about it. As a team you’re there to support each other and make great titles with whatever resources you have! I hope this helps you guys and girls out. Obviously these aren’t set in stone rules, just my experiences that I thought I’d share with everyone and I hope they are of benefit to people. We caught up with Derp Studios’ Chris Ledger to find out how the road to Make Something Unreal Live at The Gadget Show has gone so far. Listen via Train2Game Radio or read it here on The Train2Game Blog. Hi Chris, how did you come up with the name of your studio? Well, we unnamed for our first few weeks, debating what to be called, and it turned out the most common phrase we were using was ‘Derp’ because we were making stupid mistakes and saying ‘Ah derp’ we ended up as Derp Studios from that. How have you found working with the Fighting Fantasy IP, which particular book is your game going to be based on? It’s based on The Citadel of Chaos, which is the second book in the Fighting Fantasy franchise. It’s been great fun to work with, we’ve had numerous playthroughs of it and we’ve bought some additional books to expand our knowledge about the lore of the franchise as well. And how are you finding getting to grips with the Unreal Engine using UDK? I really like UDK, it’s brilliant, absolutely fantastic. We had a few teething problems at the start with the mobile functions as it’s completely different to the PC version, almost. But we were gutted about the terrain, but we’ve worked our way around it by exporting an object and re-importing it, so we’ve overcome the teething problems and it’s going quite well at the moment. How are you finding the work compared to pressured environment at the Train2Game and Epic Game Jam? It’s probably equally as stressful sometimes, especially because of deadlines…and even though we’ve got more time to do things, our scope is a bit bigger than what we were doing at the game jam. I suppose it’s equally as stressful, but just as enjoyable. What deadlines have you met recently, and what progress have you made with your game? We’ve done our pre-Alpha, so we’ve compiled a small build with most of our mechanics in, just fine-tuning that. What we’ve been doing lately is mostly getting the character models out the way. We’ve done the majority of the levels that we’re planning to have in the game, and now it’s just the character models and adding the code to them. Tell us about the genre of game you’re working on for Make Something Unreal Live. It’s a first person RPG. I haven’t seen anything like it on IOS devices at all, I’ve seen first person shooters, but nothing that’s first person melee and magic based, so it should be quite eye opening and interesting to see when it’s fully done. Does the game have a bit of a Elder Scrolls V: Skyrim vibe to it then? Yeah, we’ve obviously, often referenced Skyrim, Elder Scrolls and other famous first person melee games. We got a bit nervous at first as people might think it’s just a watered down version of Skyrim, but…they’ll love it! And it fits in nicely with the Fighting Fantasy IP as well. Yeah, we’ve taken extra care to fit it perfectly with the IP. Our game is in fact a sequel to The Citadel of Chaos game book. Why is it a sequel rather than being based on the book itself? Well, it’s based on the exact same settings, it’s just happening a week afterwards. In the game book, at the end, you kill the main bad guy, and we thought we could have a bit of a twist on it where events happen after his death, but it’s all related to him. So, it’s got a lot of twists that relate to the book. How are you looking forward to going to The Gadget Show and making a game in that public setting? I’m nervous and excited at the same time. Well, more excited. It’ll be great just to show off what our studio is doing. It’s eye opening for the public as well. 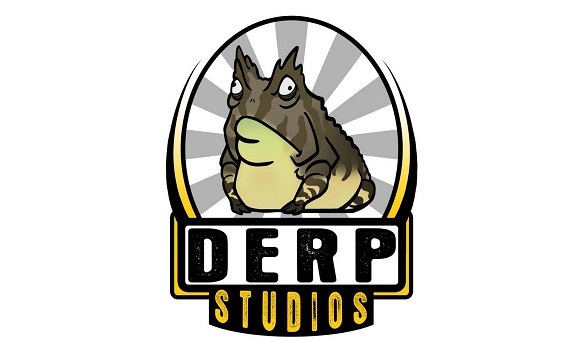 How can people who want to find out more about Derp Studios on Facebook and Twitter? Great Chris, thanks for your time and good luck.